Simple Asian-inspired ingredients combined with the ease of a slow-cooker make this a quick and easy family dinner. Everyone will love the sweet and tangy sauce over juicy pieces of chicken, and you'll love the easy preparation. This recipe is ready after a quick grill on the stove and 5-6 hours in the slow cooker for en easy meal everyone will love. RecipeSavants.com Simple Asian-inspired ingredients combined with the ease of a slow-cooker make this a quick and easy family dinner. Everyone will love the sweet and tangy sauce over juicy pieces of chicken, and you'll love the easy preparation. This recipe is ready after a quick grill on the stove and 5-6 hours in the slow cooker for en easy meal everyone will love. Smart Recipes, Asian Recipes, Chicken Recipes, Recipes Chicken Asian Asian Chicken PT6H15M Serves 10 Ingredients: 3 Pounds Chicken Breasts 2 Tablespoons Canola Oil 0.33 Cup Soy Sauce 2 Tablespoons Brown Sugar 2 Tablespoons Water 1 Clove Garlic 1 Teaspoon Ginger 0.25 Cup Silvered Almonds Heat oil in a large skillet on medium heat. Add chicken and cook for about 4-5 minutes or until golden browned from all sides. Place chicken in 5-quart slow cooker. In a bowl, mix together garlic, ginger, soy sauce, brown sugar and water until smooth. Pour the sauce on top. Set the slow cooker on low heat. Cover and cook for about 5-6 hours until desired thickness of sauce. Transfer to the serving platter. 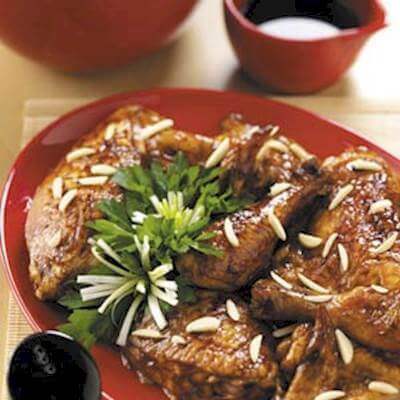 Top with almonds and serve hot.